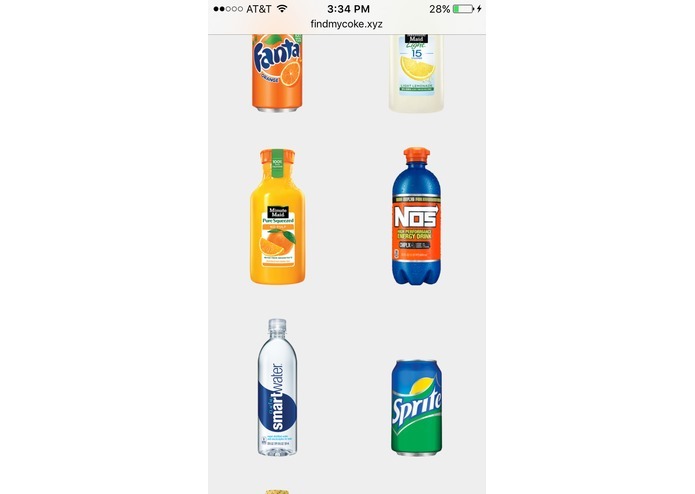 "Refresh" an app that lowers the frequency of having customers show up to a cooler that doesn't contain their drink. Customer Web app - beverage selection - Customer picks what drink they are looking for and the map shows them where its available at. 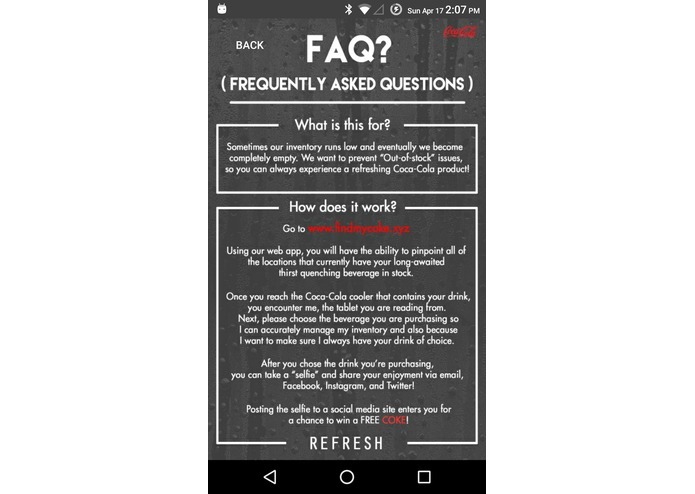 Issue: Solving Coca-Cola's big problem of customers going to Coca-Cola coolers that don't contain their desired beverage due to it being out of stuck. The cooler was never refilled with the product. Want to watch individual videos for each app? 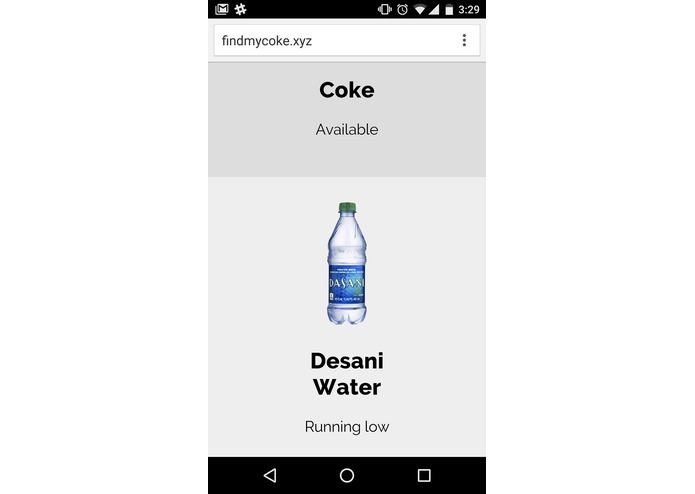 1 - Android App (This is the tablet on the cooler which says "Hey, a cooler is located at my location"
Go to findmycoke.xyz for Drink/Cooler locator. 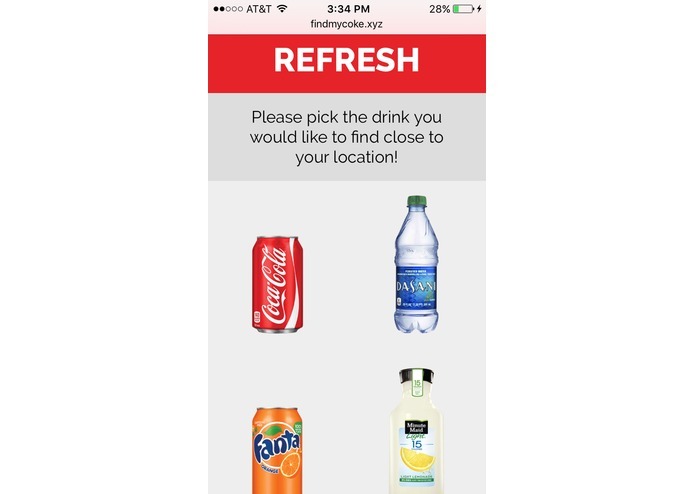 Using our web app, you will have the ability to pinpoint all of the locations that currently have your long awaited thirst quenching beverage. Once you reach the Coca-Cola cooler that contains your drink, you encounter me, the tablet you are reading from. 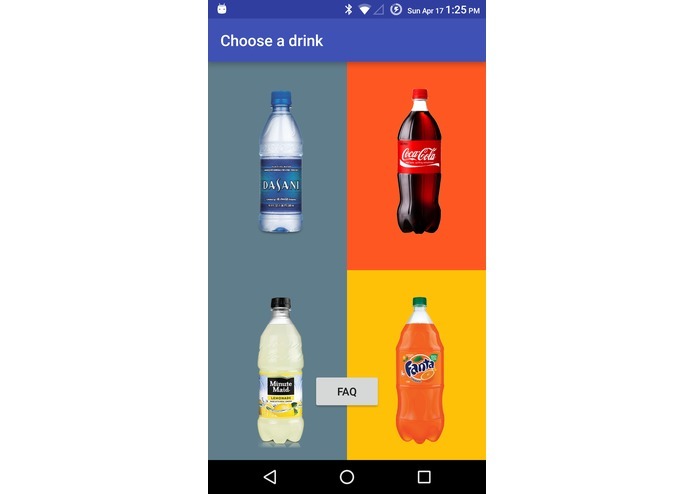 Next, please choose the beverage you are purchasing so I can manage my inventory and also because I want to make sure I have your drink at all times! 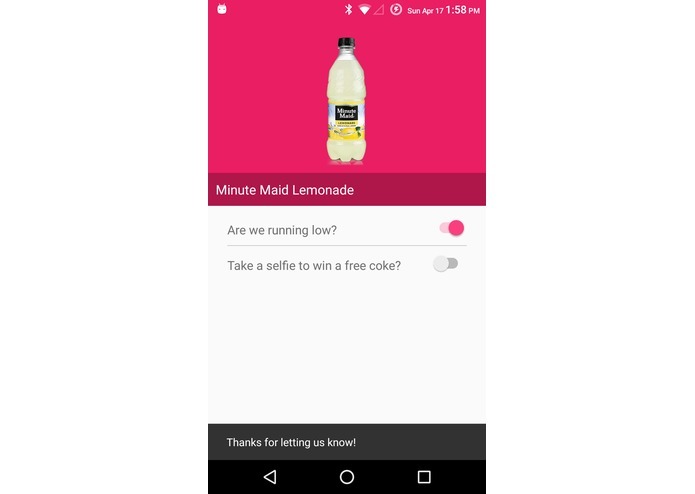 After you choose the drink you're purchasing, you can take a "selfie" and share your enjoyment via Facebook, Instagram, Twitter, and various other social medias. 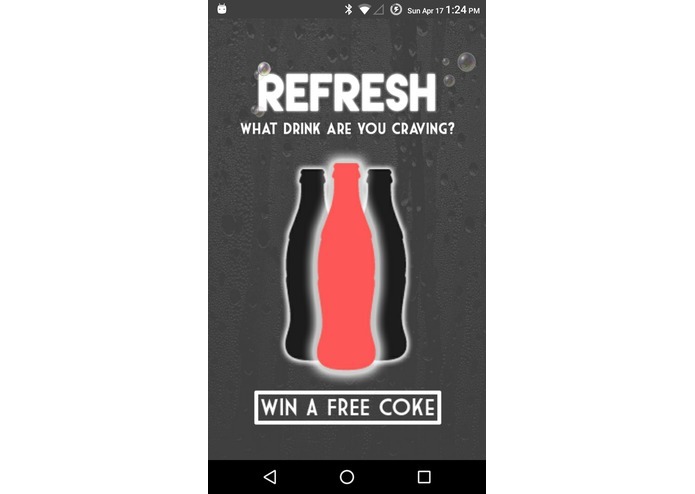 The selfie will be taken from the tablet that is mounted on the Coca-Cola cooler and using the front-facing camera the user can snap a selfie to be shared! Marketing opportunities are endless. Why? 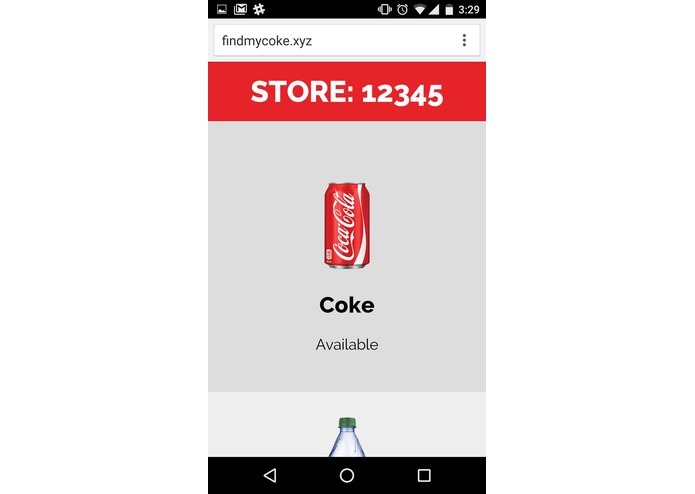 First, since there is a live check for users to see if a store contains a drink, it gives the store owner the incentive to always stay stocked up because they don't want their product availabities to show as "unavailable". Why would the customer want to help keep inventory and even use the app? 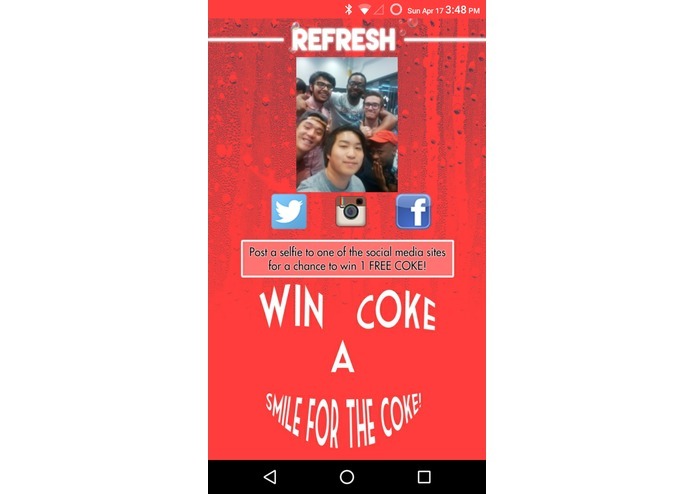 Well, there's a free on the spot Coke product if they submit a selfie to social media. This could be a marketing campaign called #smileforthecoke Also, humans are social creatures and they want to take pictures and post it to their friends to see. "Hey, look! I got just bought a Coke!" This is basically "sharing" a coke through social media. Scenario 1: A dehydrated tourist is walking around the streets of Atlanta where he is in dire need for a ice cold "refresh-ing" Sprite. So he goes to a store and they happen to be out of Sprite, but they do have Coke! He doesn't want a Coke. Oh no....! Okay... now I want my next favorite drink... a Pepsi...."
Scenario 2: A dehydrated tourist is walking around the streets of Atlanta where he is in dire need for a ice cold "refresh-ing" Sprite. 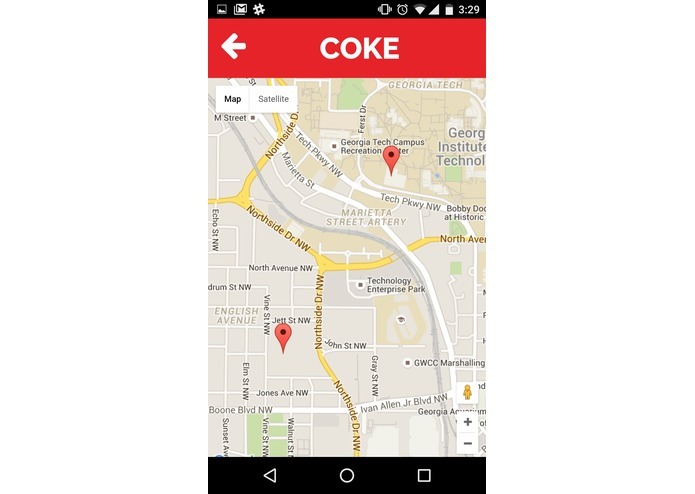 So he takes out his phone and goes to findmycoke.xyz, where he then taps on a Sprite. He walks directly to the store that provides his desired beverage. He sees he can win another Sprite cause of the "Win a FREE coke" button. He clicks it and then picks a Sprite cause thats what he is purchasing. He then takes the selfie so he has the chance to win another drink by posting the selfie to Facebook for all of his friends to see which was taken by the tablet on the door where he is cheesing with an ice cold refreshing Sprite! Ahhh... another satisfied customer and a great way to include social media marketing. This solution collects different user inputs from each cooler and determines if the cooler needs to be restocked with one or more different products. They will have to install the tablet mount onto the cooler. What materials does your solution require? A tablet and a mount for the tablet to be placed on the door of the cooler. Also, access to the internet to connect to the web app. The cost to implement this solution is approximately $40 - 70 per cooler. It only costs a tablet that is capable of taking front-facing pictures and a mount for the tablet. We had some problems with our android app near the end of the hackathon. There was a slight misunderstanding with some of the features on the android app that made us remake those features again fro scratch. We learned how to use and implement Firebase in our app. CoolerHack had the best food at any hackathon we have ever been to! I worked on the web app the one for the customer. Worked on the web apps. Both the one for the client and the one for the store owner. Created and populated the database with Firebase. Used AngularJS to create the web apps as SPAs. I worked on the Android mobile app with Java and integrated Firebase with it. I worked on the conceptualizations and ideas. Also, I worked on the front-end designs for the Android app.